WOW...that is a nice color!! Just a quick note to say that I've rejoined the Suzuki fraternity in Singapore. Replaced my wife's 10 year old Toyota Vios (that's a Yaris sedan stateside) with the new Suzuki Swift. It's a one liter 3 cylinder turbo. Super light so it makes for a zippy city car. 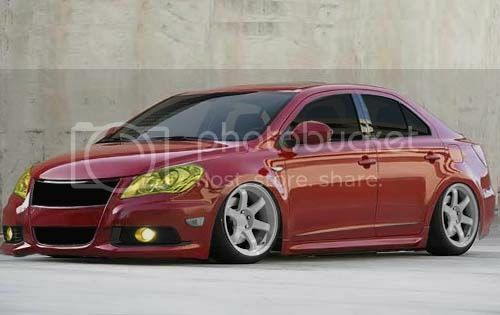 Sure miss the Kizashi though. I haven't even seen one on the road for a year now. I think you know, but someone in New Zealand now has your unique wine-red Kizashi. The Swift is pretty perky as it is extremely light. About 940kg I think. The 1L turbo 3 cylinder has enough torque to cause some torque steer if I am a bit too enthusiastic on the throttle. It has an odd rumbly vibration which I understand is due to the 3 cylinder engine. No rattles (yet) unlike my old Kizashi. My wife is the main driver of this car and she really enjoys it. I'm still driving the now 11.5 yr old Camry. I'd really like to have a go on the new Swift Sport (not yet launched in Singapore though available through a grey importer). The new Vitara 1.4 turbo (same engine as the Swift Sport) should be coming too and would be a nice compact SUV for the urban jungle Singapore is. Both the Kizashi and Swift always allowed me to enjoy my drives!